Since the early 1980s, the personal computer has been sitting at the core of people’s experience with technology. But several trends have chipped away at that dominance for the last few years, first with the rise of dedicated devices with computer-like attributes (eg. ereaders and MP3 players), then with reintegrated devices that brought several of those features back together in a more portable form factor (smartphones and tablets). Along that curve, Microsoft and Intel found themselves in an increasingly difficult position, largely trying to hold on to the legacy platforms that sourced the largest portion of their revenues while unsuccessfully trying to find ways to play in the new world. Along the way, the two companies grew farther apart. In late 2004, I had called for Apple to move to Intel chips, a call that was met with derision by most people at the time because they thought Intel would never do anything that could run counter to Microsoft’s worldview. A couple of years later, Apple and Intel did make the move, creating what was possibly the first wedge in the Wintel cartel. Last month, Microsoft made an announcement that was probably similar in terms of overall strength, looking to ARM processors as the future, and moving to a space where their reliance on Intel processor was relegated to the back of the bus. It wasn’t entirely clear at the time but one could see that the Wintel alliance had been hobbled and could possibly die off soon (in related news, HP announced this week that it would consider running its webtop OS on PCs). Meanwhile, it was only a year ago that Intel and Nokia announced a strategic partnership, where they would merge their OS platforms. The intent there, I suspect was for Intel to start pushing its own chips into Nokia devices, allowing them a play they had longed for in the mobile space. Yesterday’s announcement from Nokia that it would abandon its own OS effort and focus on Windows Phone 7 probably infuriated some people at Nokia. Of course, there is a lot of doubts about the partnership. High level partnership have a tendency to fail (in fact, Horace Dediu has shown Microsoft’s particularly bad track record in the mobile space). But I disagree. Earlier this year, I argued that Microsoft would acquire Nokia for its distribution footprint. At the time, I did not elaborate but here’s how I see things working. For starters, let’s look at areas of strength and weaknesses. Microsoft still has a large development community used to developing with its toolset and aching to get into the mobile space. With Windows Phone 7, that crowd now can use the same skills, programming languages and development kits they have been used to for years to create for years. In simplest terms, this alliance can dramatically increase the customer base for Windows Phones, and, by extension, your apps and games. 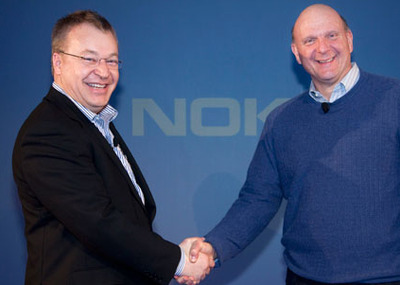 […] For example, Nokia already has strong relationships with operators in more than 190 markets. Nokia also manages an application marketplace that delivers 4 million downloads per day; a channel that will complement the existing Windows Phone Marketplace experience to bring Windows Phone developers and Nokia customers together. From a tools and platform perspective, we’re working to make it as easy as possible for developers to take advantage of this new opportunity. So the message they send here is clear: more people to use your apps and you can use the same tools you know already. This is bound to help create a market where lots of new apps will end up being created in a Windows Phone 7 environment only. So how big is the marketplace we’re talking about? Well, before we enter this arena, let’s make a few key assumptions: growth in the mobile space is largely coming from the smartphone category. In fact, the entry of sub-$100 android phones is basically going to kill the concept of smartphone altogether by just gobbling up the regular phones and pushing the trend to every phone becoming a smartphone. So the game here is for the whole pie instead of a smaller portion. So how does Nokia do in that space? The Symbian operating system, the one the company is abandoning, was on 37.6 per cent of smartphone devices in the last quarter but Nokia overall marketshare in the mobile space was 28.9 per cent. How does it compare to others? In the OS game, Nokia has a 15.1 per cent lead over Android, its next nearer competitor (Apple comes in 4th, behind RIM) and an 11.3 per cent lead over Samsung in the overall mobile space. Meanwhile, Microsoft was nowhere to really be seen, with a mere 4.2 per cent of the OS market, coming in above “others” in the OS category. If the tie-up had happened last quarter, the combined team would hold first place with above 40 per cent of the smartphone market, almost double their nearest competitor (Android) and almost triple Apple’s own offerings. With that large a footprint, any developer will have to think about supporting those devices. Furthermore, Nokia has a long-established relationship with phone carriers around the world (while I have not checked the data, I would be ready to venture that there isn’t really a phone carrier out there not carrying some Nokia phones). That kind of network will be hard to defeat moving forward. We have invented a new technology called multi-touch. It works like magic, you don’t need a stylus, far more accurate than any interface ever shipped, it ignores touches, mutli-finger gestures, and BOY have we patented it! Apple later sued HTC and Motorola over some of those patents. Meanwhile, Microsoft has not been shy in suing some companies over patent infringement relating to Google Android. The operating system from Google continues to be challenged in court, the most recent lawsuit coming from Oracle over alleged infringement of Java related patents. Friday’s investor meeting will also address other aspects of the company, including its services strategy, its plans for its Navteq navigation unit and its plans to leverage its huge patent portfolio. Between Microsoft’s patents in the mobile space and Nokia’s, I suspect we are soon going to see some lawsuits emerging from the new partnership and going after different aspects of the iPhone and Android devices (though I suspect Google will be the first target, with the iPhone being left for later). Between Microsoft’s strength in the development community, Nokia’s strength in the hardware and distribution realm, I would venture that we may be seeing the beginning of a major shift in the mobile landscape. Both of the partners are quite strong and I would not be completely surprised if they were to both be able to reverse their fortunes in the mobile space. I also would not be totally surprised if, at some point down the line, Microsoft were to announce that it is taking over Nokia and folding it in. An interesting thing is that the cut in the overall market capitalisation of Nokia after the announcement has now left it in a position where Microsoft could buy it in cash if it felt like it. However, there are still a few things to be ironed out. For starters, Microsoft has just tied its OS to one partner and may have difficulties convincing other players to build mobile phones. Expect Samsung, LG, and HTC to stop investing in Windows Phone 7. So if Nokia fails in regaining some momentum as a result of this partnership, it may take with it Microsoft’s hopes in the mobile space. Tristan Louis is the founder and CEO of Keepskor and writes the influential tnl.net weblog, where this was initially posted under the title Winkia rising.